M&D has officially opened its activities plan. The first project coordination meeting was held in Brussels, with the presence of representatives of all the cooperating bodies. 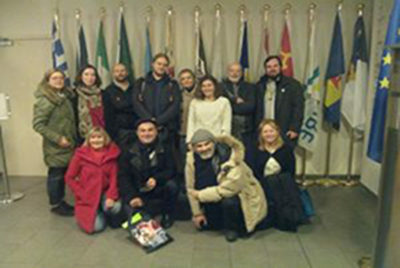 The meeting was hosted by the Tuscany Region, at its delegation of Rond Point Shuman, in the heart of the European district of the Union capital, a step away from the European Commission. Project Leader and Partners were able to discuss the activity plan and the strategies to be implemented in order to achieve the expected results. They have dimonstrate great enthusiasm for the start of this adventure blurred only by the recent passing away of one of the proponents, Will Chamberlain. Will, director of the Belfast Festival of Folls for several years, was a key person for the project's birth, and he unfortunately failed to attend this first meeting because cancer did not allow it to him. The cooperation of M&D between 2018 and 2020 will relaunch the cultural and artistic value of the popular performing arts in Europe, and also it will be dedicated to what his figure and his enlightened vision has represented. Francesca Pinochi, Councilor for Culture of Municipality of Certaldo (IT); Alberto Masoni, Organizing Director of Mercantia Festival, Certaldo (IT). Richard Lavery representing the Festival of Fools in Belfast (UK). Juan Carlos Garcia and Cristina Maciá Mateu for Maracaibo Theatre of Elche (ES) Leszek Styś, Magdalena Kocur, Adam Bismor for Proscenium Association / Teater A of Gliwice (PL). Guests and consultants: Alessio Michelotti and Roberto Leopardi, Open Street aisbl, Brussels (BE); Andrea Brugnera, Kamina Teatro (IT), artistic director of the project.